In many homes, bathroom space is limited. The bathroom is often the smallest room and most used. A standard bathroom in a home typically measures 5-by-7 feet. In that space you will find a toilet, sink and shower/tub combination. Bathrooms may be intentionally designed that way to create more living space in bedrooms and on the main floor. Remodeling a standard-sized bathroom presents an intriguing challenge to interior design professionals, especially if you plan to remodel within the existing space. Interior designers are inspired by the needs of homeowners who want their bathroom to be more comfortable, practical, feel spacious, look great and add value to their home. Designers consider the function of the room, the best placement of elements, use of products and aesthetics. Every inch counts if your space is small. 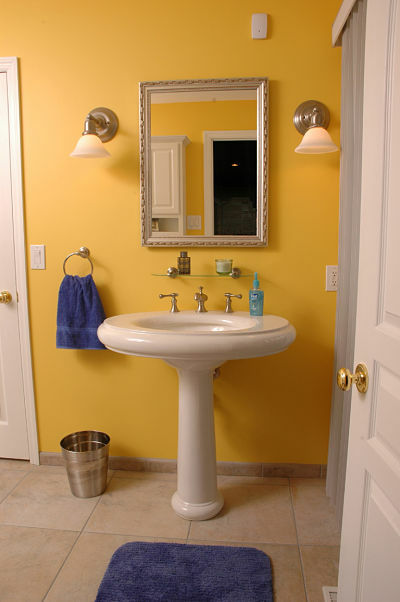 In a standard bathroom, removing an old vanity and replacing it with a pedestal sink will free up floor space. In doing so, you may be sacrificing storage space that the old base cabinet provided. Consider your options for a toilet to optimize floor space. Toilet bowls come in two basic styles, elongated and round. Using a round bowl can conserve space. An elongated bowl measures up to 31-inches from the wall, while a round bowl has a maximum depth of 28-inches or less. One-piece toilets occupy less space and are easier to clean than the two-piece bowl and tank models. Tankless toilets are a new product on the market and save both space and water but are costly. You’re more likely to see these models in new construction. Water supply lines may need to be replaced to accommodate the fixture and loss of electric power will make the unit inoperable. Discuss your storage needs with a designer. 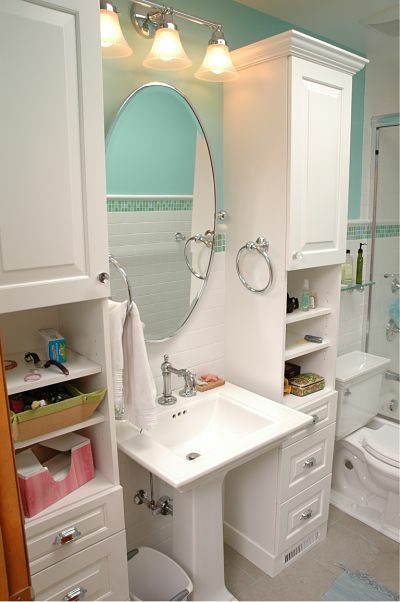 Adding shelves built into the wall or over the toilet for storage will conserve floor space. Glass wall shelves can be an attractive solution for bathroom storage. Glass stands up well to humidity and is easy to clean. Consider using baskets on shelves to contain clutter. Towels, cosmetics, grooming items and bath supplies can be stored in baskets. Today’s bathtub shower units offer many features that improve both the look and function of an old tub. Tub and shower units may have a hinged glass surround for containing water and easy maintenance and can be placed in a corner of a bathroom. Tub and shower units also come in a variety of shapes, designs and may have an easy care surround with wall shelves and safety bars. 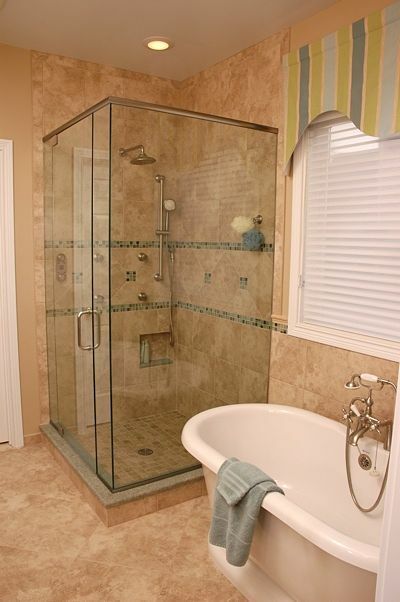 If space is tight, consider a walk-in corner shower or a smaller freestanding tub that requires less room. Light colored ceramic or vinyl flooring will make the room appear more spacious. Wallpaper, especially wallpaper borders, can make a room feel confined. Painting the door and trims white, and the walls a light bright neutral color, makes a small room seem bigger. Popular paint colors include white, beige, light gray, yellow, light green or pale blue. Mirrors reflect light in a room to create an illusion of space. Mirrors are also functional. A mirror placed over the sink for grooming or a recessed mirrored medicine cabinet for storing supplies and cosmetics are essential fixtures for any bathroom. Medicine cabinets are making a big comeback because of new designs and features. They come in framed and unframed styles and a variety of shapes. They also come with lights and electrical outlets. 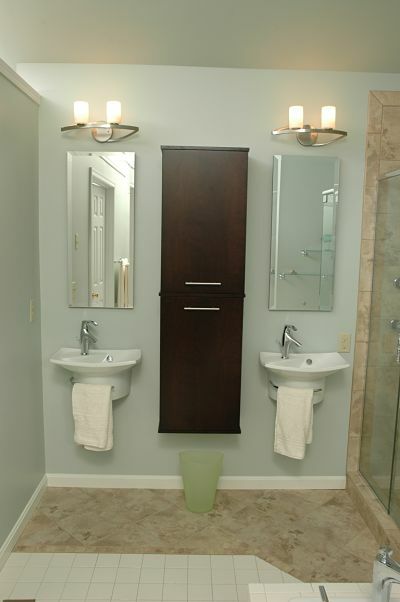 Try using two or three medicine cabinets to add interest and as a solution for storage and lighting. Tile design is especially important in a small bath for both function and visual appeal. White ceramic tile is timeless but accent tile and using a variety of tile sizes, forms and textures adds interest. Tile is also an element that can add value at resale if it is appealing. This is where an experienced interior designer’s training and expertise can really pay off. Separate tub and shower fixtures. A counter with two sinks.